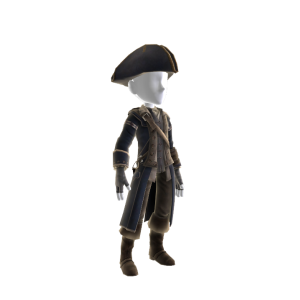 Don a piece of the Captain of the Aquila’s fabled history when you outfit your Xbox LIVE® Avatar with Connor’s Naval Suit. Complete with the captain’s blue overcoat and tricorn hat, you’ll be dressed and ready to explore the high seas. Look the part. Play the part. Only from Assassin’s Creed® III.